On March 21st, Tsetserleg Mongolia Sister City Chair Bolor Smith, with the generous sponsorship of the Fairhaven Rug Gallery, held Bellingham’s now annual Tsagaan Sar (Mongolian New Years) event that included an afternoon of music, stories, delicious food, good friends, and shared cultures. 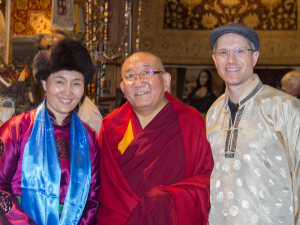 This year Arjaa Rinpoche, the spiritual teacher of the Mongolians and Tibetans in America, and founder of the Children’s Cancer Center in Mongolia, joined the festivities this year. Arjia Rinpoche is the only Tibetan high lama of Mongolian descent. He excels in the knowledge and understanding of Tibetan art, architecture and the Tibetan Language. He has given classes in Buddhist Art and Sutra throughout the United States, Canada, Taiwan, India and Guatemala. In honor of Arjaa Rinpoche, the band Monkey Puzzle wrote and performed a new song, “Rinpoche Walking in the Rain”. The three piece band’s song was peaceful, soft and yet full of the joy of walking in a spring rain. Monkey Puzzle is a local Bellingham based band who have performed for the Rinpoche before. There were also story tellers – Doug Banner, Rebecca Mabanglo-Mayor, and Karen Thomas. Story telling is a big part of Tsagaan Sar, and each of the stories drew in the audience, especially the children. Rebecca Mabanglo-Mayor’s story captivated the kids with witches, a magical horse, and a special child. Arjaa Rinpoche recognized a number of those who helped make the day possible with the presentation of a Khadag (symbolizing purity and compassion) to the Monkey Puzzle band for their music, Bolor Smith for sponsoring, Arshia Fathalli, for the use of Fairhaven Rug Gallery, and Henry G. Schwarz who founded the Center for East Asian Studies at Western Washington University, and who in 2006, in recognition of Dr. Schwarz’ thirty years of promoting Mongolian Studies in the United States, the President of Mongolia awarded him the nation’s highest honor for foreigners, the Order of the Polar Star. This entry was posted in Bellingham Sister Cities Association, Tsetserleg Mongolia and tagged Arjaa Rinpoche, Bellingham Sister Cities, Bolor Smith, BSCA, Fairhaven Rug Gallery, Monkey Puzzle, Tsetserleg. Bookmark the permalink.